CLAYPOOL — An Elkhart man who police say they identified as having been driving during a property damage traffic accident faces an additional charge after officers say he became combative and belligerent. Andrew Thomas Tokar, 27, 15141 Glenmore St., Elkhart, is charged with intimidation of a law enforcement officer, a level 6 felony; and operating while intoxicated, a class A misdemeanor. According to the affidavit of probable cause, an officer from the Claypool Police Department responded to a property damage crash on Feb. 22 at an undisclosed location in Kosciusko County. Callers told dispatchers that the vehicle was stuck on top of a mailbox and that the driver was possibly intoxicated. Officers arrived and reported finding Tokar walking down the road near the scene. Police said Tokar admitted to having been driving the vehicle and officers reported smelling the odor of alcohol on his breath. Police added that Tokar displayed an abrasive attitude and that he began to swear at officers. Officers reported that Tokar began slamming his head into the side of a patrol vehicle. A unit from the Warsaw Police Department responded and Tokar was placed in that unit’s custody. Police obtained a search warrant for Tokar’s blood. Police reported that Tokar was taken to Kosciusko Community Hospital, his blood drawn and sent to a lab, which later reported a blood alcohol content of .32 percent. 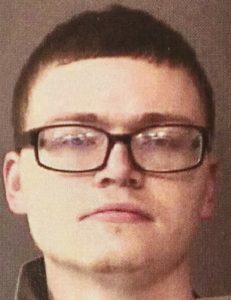 Officers reported that on the way to Kosciusko County Jail, Tokar made verbal threats of harm to the officer or officers involved in the transport.